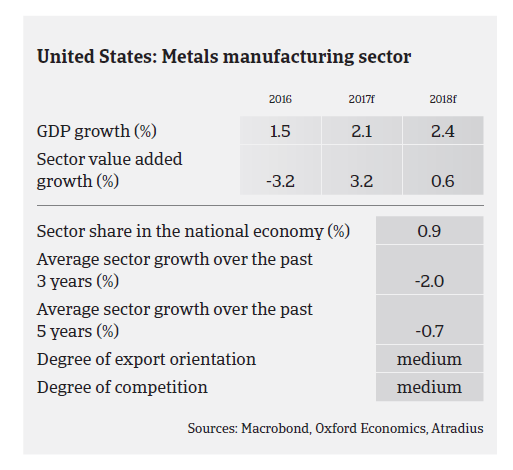 In 2015 and in H1of 2016 the US steel and metals sector´s revenue performance was severely affected by the lower cost of imported steel and decreasing demand from the oil/gas industry, which suffered from the oil price decline. The latter has particularly affected the oil country tubular goods (OCTG) sector. Since H2 of 2016 a modest rebound has started as steel prices increased again and demand from the OCTG sector stabilised, with more oil rigs added each month in 2017 and old inventory being sold and newer products being purchased by suppliers. At the same time, demand from automotive and construction has remained robust, although we expect demand from automotive to flatten out in the coming six to nine months. According to the World Steel Association, US steel production decreased 0.3% in 2016, but rebounded 2.4% in the period January-August 2017. US steel demand is forecast to increase by about 3% annually in 2017 and 2018 after a 4.7% decline in 2016 as robust US economic growth is set to continue. Profit margins of steel and metals businesses have stabilised again after a substantial deterioration in 2015 and H1 of 2016. Financing requirements and gearing are generally high in this industry, and banks have become increasingly willing to provide loans to businesses after a more restrictive stance in 2015 and 2016. While the overall financial and credit conditions are generally stable, steel/metals companies still must be financially very viable in order to obtain their preferred lending terms and interest rates. The average payment duration is, on average, 30-45 days domestically and 60-90 days for businesses abroad. Payment delays and defaults have stabilised after increasing in 2015 and 2016, when the cash flow of end-buyers was impacted by lower growth, especially in the OCTG sector. Steel and metals insolvencies have remained stable over the last six months, and are not expected to increase sharply in 2017 and 2018. However, an increase in both payment delays and business failures in Puerto Rico and the area around Houston with its large oil industry cannot be ruled out. Both places have been severely affected recently by natural disasters (hurricanes Maria and Harvey). While the Houston area has recovered relatively well, issues in Puerto Rico are expected to last at least one year before a return to normalcy. Therefore, we expect payment delays and business failures, especially on the island of Puerto Rico, to increase. 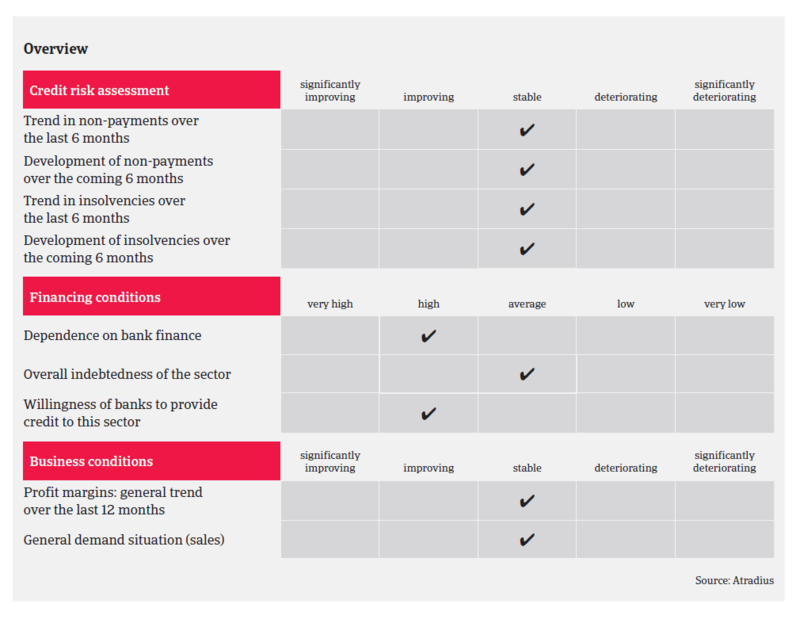 Our underwriting stance for the steel and metals sector is neutral to restrictive as, despite the recent improvements, the industry has suffered a significant downturn in 2015 and early 2016. The financial situation of many businesses has just begun to stabilise, while the market environment remains volatile, with cheaper steel and metals imports still remaining an issue. We closely monitor the situation in the Houston area and Puerto Rico, where suppliers need to closely monitor and verify payment practices to make sure companies have sufficient resources to support the rebuilding process. A major country-wide infrastructure improvement scheme announced by the US government would certainly help the sector, while the on-going rebound of energy sector investments could turn out to be limited due to increased efficiency of shale producers. US steel mills still run at just about 75% of capacity, and in August 2017 major US steel producers urged the Trump administration to impose import tariffs under Section 232 of the Trade Expansion Act of 1962 (which allows the US president to adjust imports unilaterally should the US Department of Commerce find evidence of a national security threat from foreign shipments). 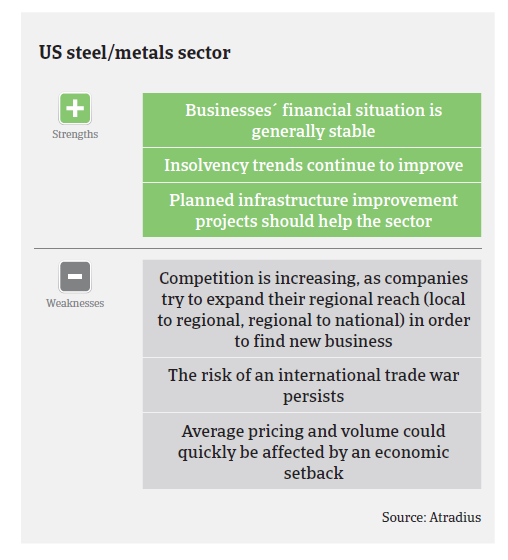 However, the US steel and metals industry is divided over this issue, as many steel/metals traders and users are relying on (cheaper) imports of metals and steel. Any major import restrictions could also lead to retaliatory actions by major trading partners like the EU or China. In September 2017 the US administration finally announced that it has postponed any decision on steel import tariffs until after the passing of comprehensive tax reform. Besides the risk of a sales downturn, the economic policies of the Trump administration could pose a potential challenge for the US car industry. Revenues of the engineering services industry have rebounded since 2015 as greater liquidity in financial markets helped to boost construction spending.